The entire world and the medical circle in particular, is witnessing a growing interest in all aspects of genetic sciences. New discoveries have been made in recent years and efforts in this field have recently culminated in the drawing of the human genome, thanks to the support rendered by the Human Genome Organisation. Consequently, several discoveries have been made, deciphering the genome of several living organisms, thus revealing many of the secrets surrounding the makeup of human beings as well as of numerous other living organisms. This has enhanced man’s ability to determine the causes of numerous diseases within his own genetic structure. Such remarkable advances have increased nations’ interest in this immensely rich science so that they may not lag behind, especially in view of the possible manipulation of genes in unethical ways and for unethical purposes. They have also recognized the need to set forth sound legal controls in this area in light of the daily breakthroughs made in this discipline at both the regional and global level. Genetic applications also have an impact on the economic sector, especially in sectors that involve the production of genetically modified crops, the production of medicines, the management of genetic diseases, and the uses of IVF and its application. We should not forget that genetics also plays an important role in determining the human physical and behavioral characters, such as skin color, intelligence, aggressiveness, and others. All these reasons led to nations’ interest in this field to reach such high levels that budgets are allocated and new institutes are built to train competitive scientists. The best evidence testifying to this is the fact that the many of the Nobel Prize winners in medicine were won by scientists engaged in genetic sciences. In 2003, with limitless support from H.H. Sheikh Hamdan Bin Rashid Al Maktoum, Deputy Ruler of Dubai and UAE Minister of Finance, the Centre for Arab Genomic Studies (CAGS) was founded. Its objective include the promotion of interest in all forms of genetic sciences. It is unfortunate that genetic diseases occur at high incidence in the Arab World. It is high time that such diseases receive due attention. In spite of the short time that has passed since its establishment, CAGS has made great accomplishments. We are proud that it has managed to bring to the limelight the prevalence of genetic diseases in our region, and has thus enhanced awareness of this serious problem at organizational and individual levels. The Centre has also managed to establish and maintain ties with prestigious Arab and international institutes and organizations in this sphere. The 2nd Pan Arab Human Genetics Conference is one such example of collaboration between the Centre and the Dubai Islamic Affairs and Charitable Activities Department. 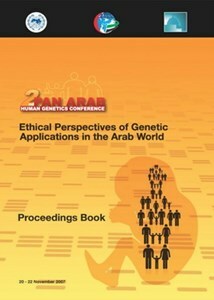 This conference was distinguished by a discussion on the ethical aspects of genetic research and was graced by the presence of Arab and world scientists, doctors, jurists and Islamic scholars and charity officials, who strived to set forth scenarios and formulas for handling fresh findings in the field of genetics. This book represents the outcome of these endeavors. This accomplishment is only the beginning of such activities in this field and stems from effective collaboration between Arab scientists and their colleagues in Arab and international organizations. Such collaborations will receive all support from CAGS, because the Centre believes that research in the field requires the consideration of rules and principles regulating these activities that form the framework of our society and beliefs.